The Mammals in Wiltshire atlas promotes the importance of Wiltshire, its habitats and mammal species, to a wide audience, highlighting the importance of safeguarding important sites for mammals, now and in the future. Wiltshire is an incredible county supporting significant numbers of many of the UK’s mammal species of conservation, ranging from recovering populations of Otters and Polecat, to Brown Hare, Water vole, Harvest Mice and Hedgehog. The county also supports nationally and internationally-important sites for bats. Furthermore, recent surveys are highlighting important populations of rare woodland bats such as Bechstein’s and Barbastelle bats. In 2013 The Mammal Society launched a national atlas project to update the current knowledge of the distribution of mammals in the UK and to promote further conservation effort. 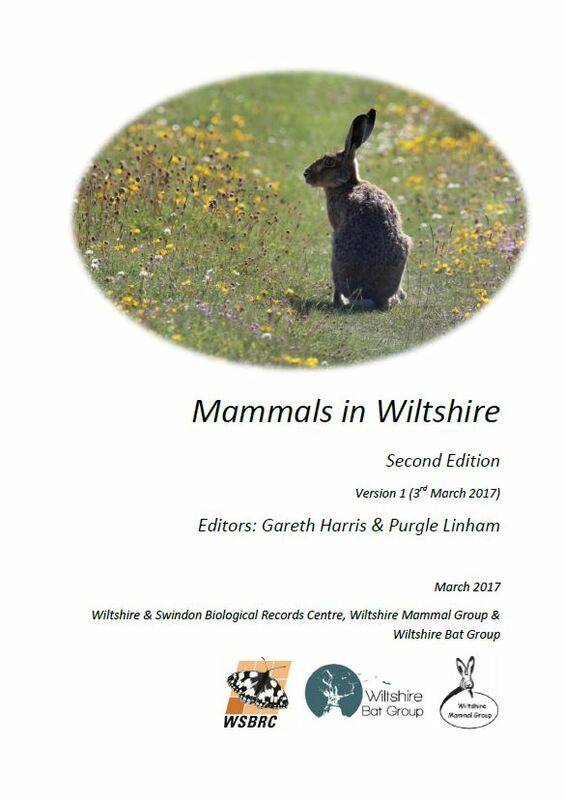 At this time, Wiltshire Mammal Group (WMG) and Wiltshire & Swindon Biological Records Centre (WSBRC), launched the Wiltshire Mammal Atlas Project to contribute to the national project and to enable the update of the previous Wiltshire Mammal Atlas, Mammals in Wiltshire, 1997. WMG was galvanised into action, recruiting new members and rolling out a series of training events and surveys to promote mammal recording and monitoring. During 2014 Wiltshire Bat Group (WBG) became a project partner and rolled out “square-bashing” surveys targeting the under-recorded areas of the county as well as training events. Additional datasets relating to long term monitoring of bats and other mammals were also gathered from existing projects and ecological consultancies. To assist with more of this work by WSBRC and our county recording groups, we’d be grateful if you could make a donation when you download the publication. Wiltshire Wildlife Trust are kindly hosting a donation page and all funding will be administered by WSBRC to support future atlas projects as well as WBG and WMG projects. The publication is web-based to ensure it is widely available, not least to the many recorders and organisations contributing to its production, and so it can be easily updated in the near future as new survey findings and data are added. The version number and future additions will be listed in the introductory pages of the document. It was supported by Wiltshire Natural History Publications Trust, whose grant supported the map production and data management by WSBRC.